You know that was supposed to be a red moon. Oh well, next time I will use a picture of the moon to add features to the surface. 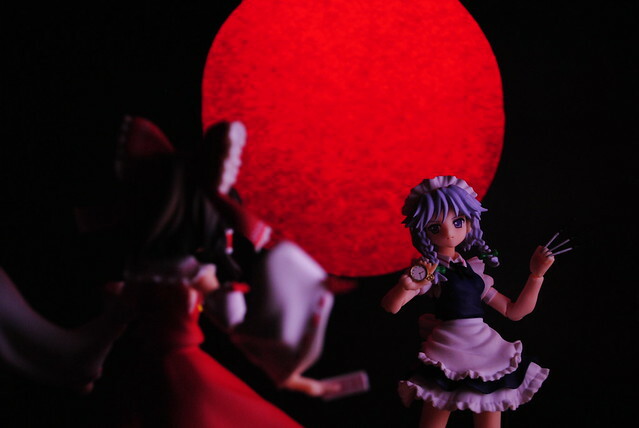 No Embodiment of Scarlet Devil shout out for me then, then again it was Remilia with the red moon as her background. Should find a clock tower for Sakuya I suppose. By the way I hate Sakuya's knives, every little bump kept making them fall off. I also ended up losing one of them during one such occasion. I wish they knives where part of the hand like the one with the pocket watch.